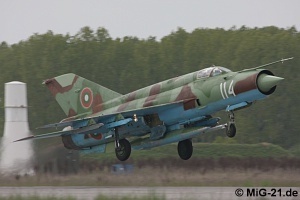 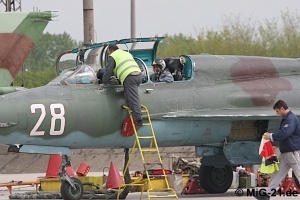 On April 28 and 29, 2009 after a longer break the author was given the chance to visit 3rd fighter air base of Bulgarian Air Force at Graf Ignatievo. 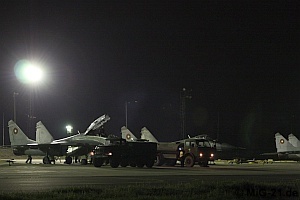 Visit took place on the occasion of the training of fighter aviation for Army Day parade on May 6. 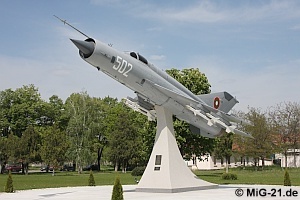 Celebrating the 45th anniversary of MiG-21's service with Bulgarian Air Force this MiG-21bis was mounted on a pole in front of the staff building at "Graf" - in traditional grey of socialist times. 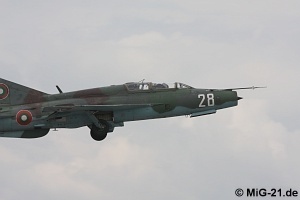 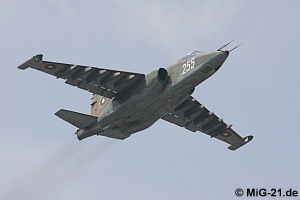 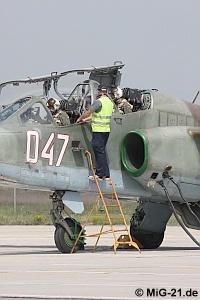 For participation in parade training four Su-25 flew in from Bezmer. 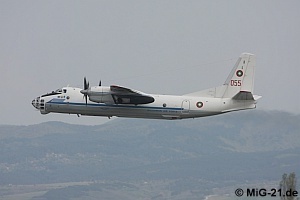 Close support aircraft were accompanied by an An-26 carrying equipment and personnel. 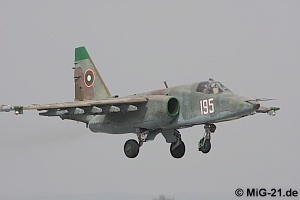 ... Su-25 took off twice a day for formation flying training. 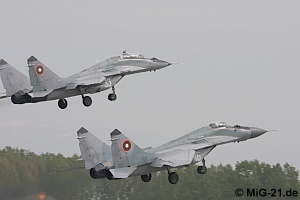 ... and the MiGs was a twinseater. 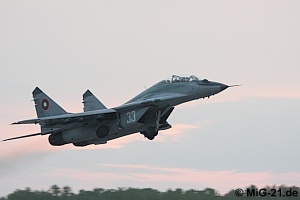 A MiG-29 took off for a check flight. 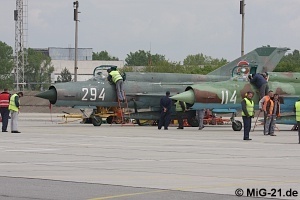 ... and two MiG-21bis took of for two flights each. 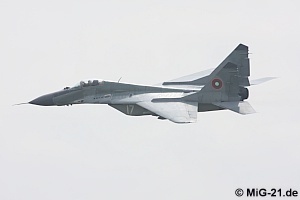 ... they took place in limited weather conditions after a short sunny period around noon was missed. 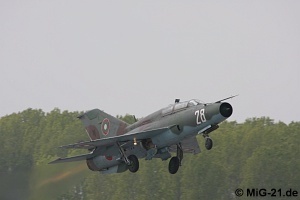 Despite the drop tank the MiG-21bis stayed in the air only for about 35 minutes. 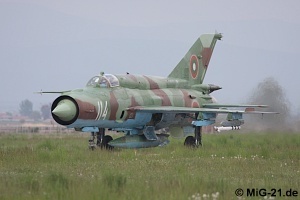 The one and only: 114 is the only Bulgarian MiG-21 with this very special camouflage. 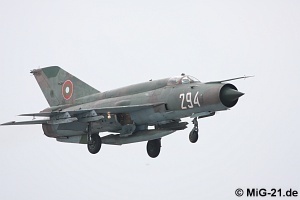 During the second wave the MiG-21bis carried R-60 training missiles. 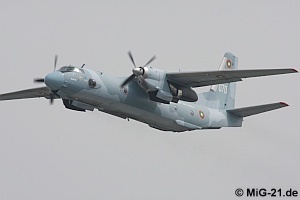 Lucky shot while waiting for flight back home: An-30 takes off from Sofia airport. 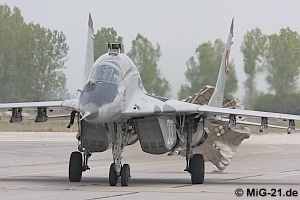 The author wishes to thank all members of Bulgarian Air Force who made the visit possible, especially Brigade General Radev and First Lieutenant Topurova.